Laser Sporting is surprisingly athletic and a huge amount of fun. 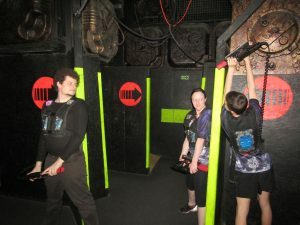 The difference between League and regular Laser Tag, is that you get to experience Laser Tag as part of an organised 5 person team. Your team will develop good communication and technical skills throughout the 10 week season to become a cohesive unit by finals time. We utilise a unique handicapping system that automatically grades players on performance, and then gives each team a % handicap on their team scores based upon the experience level of the players on the team. The system has proven successful in giving all teams a chance no matter what experience level they might be. Our league at Code Red is lucky enough to have a number of experienced national level players to guide new players coming through. You will learn all the tricks of the trade from the best in the business. League is played on a Sunday night from 6:30pm – 9:30pm. The season runs during the school term with a 2 day competition at the end of term and breaks for school holidays. The recommended age to start playing is 13 years. Played on a Sunday Night from 6:30pm-9:30pm. Cost is $15 per week. Players are welcome to join at any stage in the season. However 3 weeks is required to qualify for End of Term Competition. NEW PLAYER SPECIAL - $30pp TOTAL for 4 weeks! You will pick up 3001 points for a base and 150 points for a tag on another player. A team’s score is predominantly made up of points from tags and points from base destroys. When a team becomes more advanced they gain an advantage by having defending players float out and collect tags when no one is attacking them. A team’s ability to simultaneously collect tags, destroy bases and reduce other team’s scores by defending bases determines their success. The game format used in Sunday League is different from standard games. The game is akin to the settings in the Australasian Laser Tag Titles. It includes the following settings. Players should be 13 years of age. With Laser League there is a learning curve, but it is pretty short. Within 4 weeks you will be able to hold your own, know which positions to take, and be starting to get a handle on some of the communication skills. The tournament administrators and senior players are available throughout the season and offer special training to show new players all the tricks and techniques of the game. If you are keen to improve your game, there will be plenty of opportunities. Are there competitions beyond the local league? Yes, Australia has the healthiest Laser Sporting community in the world. 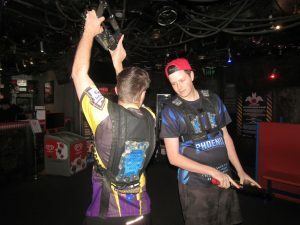 Each year we host a Laser Tag tournament that averages over 25 teams from around Australia and New Zealand, The Zone Australasian Championships. Here is your chance!.